Once you determine the materials you’d like to recycle and/or compost and who’ll haul them, you’ll need to install bins to collect the materials. A good collection system is the key to capturing more materials. Do you need new bins, or a bin system, or can you repurpose existing ones? Do you need one bin with multiple openings for different streams or separate bins for each stream (i.e., recycling, composting and/or trash)? What space is available for bin placement in the front of the house? If you face size constraints, the depth and width of bins are important, but keep in mind that height is important too, to ensure accessibility. Will your bin system need to store a rolling cart or slim jim type bin? How will the waste be emptied by staff? Through a door at the front or in the back of the house? Will the entire bin need to be wheeled to another location? Will users walk or drive up to outdoor bins? Bins used outdoors have different design needs to ensure trash doesn’t end up as litter. Will you need restrictive openings on the bins to prevent contamination of materials? The openings should be appropriately sized -- not too big or small -- to accept the materials. What other functions does the bin needs to address? Will trays be collected and stored on top of or near the bin? You may want to have additional storage for supplies, such as bin liners or cleaning supplies, inside the bin. Can your bin system be adapted to accept different streams and items in the future? Are recycling and composting bins in easy-to-access locations in your dining, kitchen and storage areas? Did you remember to add recycling and/or composting bins next to outdoor seating areas? Are your recycling and/or composting receptacles placed next to trash bins? What color bins should you use? Colors can help identify different waste streams, like blue for recycling, green or brown for composting and black or gray for trash. Check what color scheme your community uses and aim for consistent use of color. What text should you include? Try to minimize text and consider what languages are needed. Can you use illustrations? Use simple photos or drawings of the materials you want placed in the bins. If they can be customized to your brand and the items found in-store, even better. Can people see your signs? Place signs at eye level for customers to see or near the opening of the bin, where materials will be tossed. Be sure to use consistent colors, labels/signage, bin order, and graphics on all of your bins, signage and promotional materials. Most bin providers can help with design, location and graphics based on your needs. Consider what to do with your old bins. You may be able to recycle, donate or repurpose them. You can create your own signage with the help of our template. 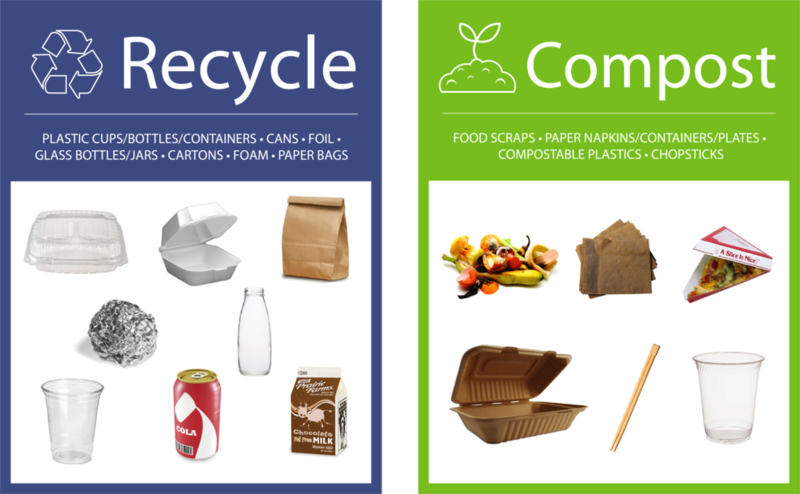 Download, and mix and match the materials based on your hauler’s specifications in each of the recycling, compost or landfill signs. Click the button below to download the signage templates.